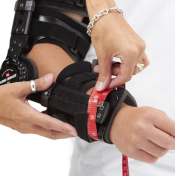 Express yourself and prevent the annoying scratching, snagging, chafing and smells that are prone to occur wearing a bionic or compression brace. Tubez! is so versatile that it can be used as a cover for tattoos, PICC-lines, braces, or as an under-sleeve. Your measurements and choice of either stretchy or fleece (perfect for blustery, bone chilling weather or for nighttime comfort) fabrics make it your Tubez! (see the tab below for more information on taking measurements). If you have a cast, then please look at our Armz! or Handz! products. Please call our customer happiness gurus with any questions at 1(800)CASTCOVER (1-800-227-8268). With a flexible tape measure, measure the circumference (distance around) of where the top portion of your Tubez! will cover. If this is an under sleeve, take your measurement without your brace. With a flexible tape measure, measure the circumference (distance around) of where the bottom portion of your Tubez! will cover. 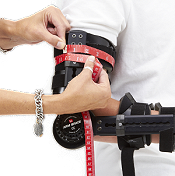 If this is an under sleeve, take your measurement without your brace.